Typically a Processor Expert component creates two files: a header file and a source file. That’s fine for normal drivers. But this does not work well for more complicated things like an RTOS or communication stacks: these are built from a whole set of source files. So how can I generate multiple files with a Processor Expert Component? %error^ This bean is not implemented in selected language & compiler ! While generating code for that driver, Processor Expert will see the %FILE command and will create a new file with the following content, and so on. Note that I’m using %’DirRel_Code’: this will place the file inside the ‘Generated Code’ folder, and the name of that folder is built from that variable. It would be possible to place the file inside a subfolder within ‘Generated Code’, but then you need to make sure the compiler can find that file (setting search path, etc). That approach is simple, but has a big disadvantage: everything is in one file. And this is especially problematic, if my component is a wrapper to an open source software stack (like FreeRTOS): if the stack changes, I need to compare my version. this is very hard with this approach. Note: the .prg files are included from a driver file. So you can use normal driver code, for example you can test on properties and so on as shown in the example for FreeRTOS: depending on the MemoryScheme, a different file is used and generated. 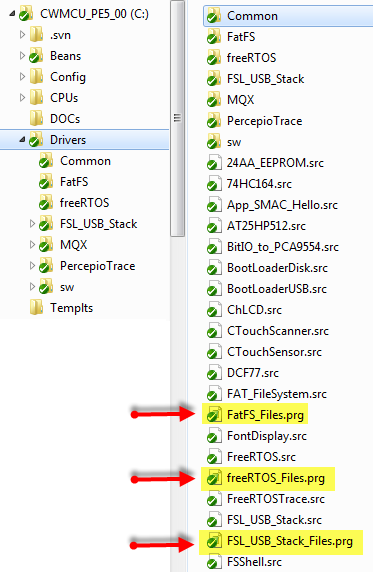 Note2: Keep in mind that the included files are treated like normal driver files. For example if I have the modulo operator (%) in my source files, I need to replace them with %% in order Processor Expert translates it to a single %. Otherwise Processor Expert thinks it is a symbol and will return an error. Here depending on the component properties, a set of different files get included and generated. Note the %FILE? (the question mark) syntax: This version of the %FILE syntax needs to be used if the %FILE is inside a conditional block. Otherwise a file will be created anyway (which is not what I want). With this, I can structure my files in a logical way, and can easily diff it against other versions. This entry was posted in CDE, Embedded Components, Processor Expert, Tips & Tricks and tagged CDE, Processor Expert, Tips&Tricks by Erich Styger. Bookmark the permalink.